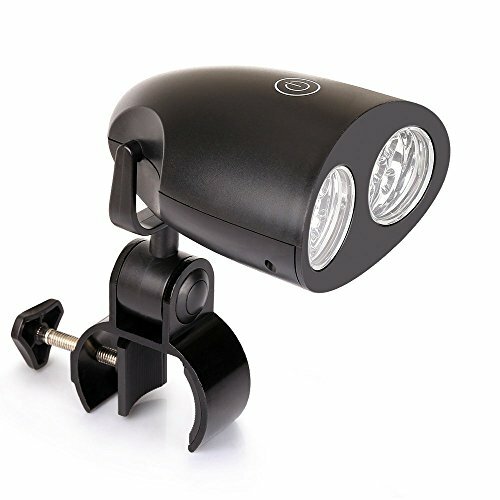 THE ULTIMATE BBQ LIGHT: Unlike other lights which are not bright enough, made out of cheap plastic materials, or simply stop working for no apparent reason, the Ultimate BBQ Light barbecue grill light has 10 Ultra-BRIGHT LED lights, is made out of durable nylon glass fiber, and will last longer than other brands out there. This means you can enjoy grilling after dark for many seasons to come and actually see what you are cooking. ENJOY NIGHT TIME GRILLING: End frustrations due to poor lighting on your deck. The Ultimate BBQ Light is easy to set-up and illuminate your entire grilling surface clearly, so you can see when your meat is grilled as you like it. No more taking burgers and steaks inside to see if they're done or carrying a flashlight to try to light up your grill. Just attach the Ultimate BBQ Light and see everything on the grill in perfect lighting. PERFECT GIFT FOR GRILL ENTHUSIASTS: Make any grill master happy. This grill light makes the perfect gift. Get ready for the summer and grilling outdoors with the Ultimate BBQ Light. GET READY FOR SOME SUMMER FUN: Don't worry about running out of sunlight.The adjustable screw clamp n will fit on any gas, electric or char-broil grill handle. With a touch sensitive power button this portable barbecue LED light is extremely versatile and easy to use. 100% MONEY BACK GUARANTEE and LIFETIME WARRANTY. Worried you may not like the Ultimate BBQ Light? Buy it - risk free! We offer a 100% Money Back Guarantee and a LIFETIME warranty. Buy once, and we'll make sure you enjoy your light for as long as you own it. The only regret you'll have is not buying one of these sooner! If you have any questions about this product by The Ultimate BBQ Light, contact us by completing and submitting the form below. If you are looking for a specif part number, please include it with your message.